More information from Cluster coming soon! 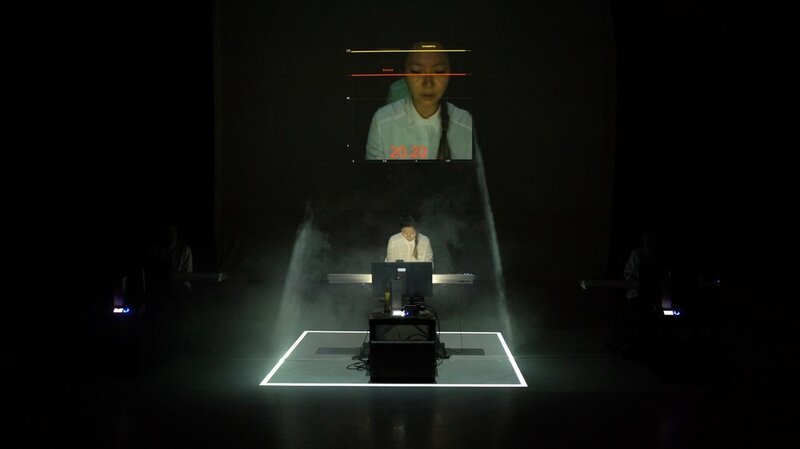 Foxconn Frequency (no.3) – for three visibly Chinese performers is a work of “algorithmic theatre” that incorporates real-time game mechanics, piano pedagogy, 3D-printing, and the poetry of former Foxconn worker Xu Lizhi (许立志). Three performers work with and against each other as they move through a series of testings and mini-games sourced from piano training. They succeed and fail in realtime, forced to correct their mistakes before they can continue. In each performance, 3D-printers output an object documenting the performer’s competency over time. There are many reasons for the restriction of “three visibly Chinese performers.” In music composition, instruments are often specified (e.g for solo violin), but almost never the body itself. By making this distinction, it is Hong Kong Exile’s intention to draw focus to the performer’s identity, to engage the eyes as well as the ears, and to bring attention to the “extra-musical,” shifting the mode of audience perception to multiple modalities. Fully automated and generative, Foxconn Frequency (no.3) is different every performance, ranging from 50 minutes to 80 minutes: an experiment in digital game-mechanics as a way of meaning making in the performing arts. We will be touring Room 2048 to Edmonton, Alberta for a showing presented by Azimuth Theatre for Expanse Movement Arts Festival as part of the Chinook series. We will be workshopping our next performance sometime Fall 2018. More details to come! No Foreigners, Hong Kong Exile's upcoming collaboration with fu-GEN Theatre (produced in association with Theatre Conspiracy) will be toured to the Theatre Centre (Toronto) in February 2018. No Foreigners, Hong Kong Exile's upcoming collaboration with fu-GEN Theatre (produced in association with Theatre Conspiracy) will be premiered at the Cultch, February 7th - 17th 2018. Hong Kong Exile will be premiering the third segment of Foxconn Frequency. The World Premiere of Room 2048 will be at the Firehall Arts Centre in Vancouver (April 11th - 15th, 2017 @8pm), with touring to Montreal and Kitchener to follow, September - October 2017. Visitors From Far Away to the State Machine will be back in Vancouver on February 3rd at Club PuSh as part of the 2017 PuSh International Performing Arts Festival. Save the date! Multimedia dance theatre and contemporary dance. Suggested $20 adults, $5 Children under 12. Workshop capacity limited to 30 people. Register on-line to secure your spot. Room 2048 will be premiered in April at the Firehall Arts Centre as part of their 2016/17 season. New project with fu-GEN Theatre under Theatre Conspiracy. To be announced soon! Residency and development at the Gateway Theatre, August 14th - 28th 2016. Further development between Toronto & Vancouver, 2016 - 2017. Premiere new work at the Cultch, November 2017.
eatingthegame will be presented at part of SummerWorks at the Factory Theatre in Toronto. Following eatingthegame last year, we've been confirmed for a return to Intrepid Theatre's Uno Fest, this time with the full-length of okay.odd., programmed alongside Freya Björg Olafson's Laissez-Faire. Uno Fest is North America’s longest-running festival of one-person shows, featuring solo performers and original theatre from around the world. In May 2016, Hong Kong Exile will be premiering a new work to be presented with one of our favourite companies in town: Music on Main! Information and tickets can be found here. The full-length version of okay.odd. will be premiered in May at Upintheair Theatre's 2016 rEvolver Festival. The world’s first eco-city, failed. 2010, the visionary project to transform a grassy island near the crowded metropolis of Shanghai into a glistening model of sustainable design and energy-efficient infrastructure for 50,000 people. 2016, an abandoned city of dreams. Live performances in the Gallery spaces, DJs and unexpected surprises make FUSE Vancouver's favourite art party—a place to see some of the best in local performance art, theatre, contemporary dance and music, plus take in the FUSE lounge. Natalie, Milton, and Remy will be showing some of their individual works. HKX will be giving a talk + workshop for An Exact Vertigo at UNIT/PITT Projects in Chinatown. More details can be found at this link. HKX has been invited to present excerpts from nine doesn't follow eight at PushOFF. PushOFF is a curated platform of tour-ready works and projects in development, timed with the PuSh International Performing Arts Festival. It is a two-day showcase event timed with the busy Assembly weekend of the PuSh Festival. Over two afternoons, presenters and artists have the opportunity to see and show work and mingle in a relaxed and social atmosphere. PushOff includes theatre, performance and dance work and is curated by James Long and Maiko Yamamoto of Theatre Replacement and Josh Martin and Lisa Gelley of 605 Collective. nine doesn't follow eight will be undergoing a second workshop iteration in January 2016 at the Gateway Theatre in Richmond. Details will be announced soon! For two months, HKX has been facilitating and working with group of artists to explore the New Westminster Museum and Archives. Join us at the Anvil Centre for a theatre-exhibition show on November 27th with new media, glitch, sound and dance work. The evening will feature works from an incredible group of young artists including Paul Lucas, Megan Friesen, Mona Lai, Alanna Ho, Tegan Wahlgren, Frances Margaret Walker Breden, Andie Marie Lloyd, and Tiana Jung. 13 Vancouver theatre companies tackle 13 short (1-10 minute) plays on Climate Change by playwrights worldwide! Milton Lim will be directing Daniel Borzillo in Neil Labute's An Average Guy Thinking Thoughts About Global Warming. Vancouver actors will present short plays by Reneltta Arluk, Kendra Fanconi, Jordan Hall, Kevin Loring, David Geary, Elyne Quan, Elaine Avila and others, as a Vancouver response to the international CLIMATE CHANGE THEATRE ACTION (CCTA). CCTA is a global series readings and performances intended to foster discussion around climate change during this November and December, coinciding with the United Nations 2015 Paris Climate Conference. The Vancouver action is open to the public and admission is free. The program will culminate in an opportunity to meet and discuss ways for theatre makers to react creatively, practically and locally to the climate change crisis. Event organized by The Only Animal, with the assistance of Playwrights Theatre Centre, playwright Elaine Avila, and Event Coordinator Mark Vulliamy. Our alma mater, Simon Fraser University, is celebrating it's 50th Anniversary this year; SFU's School for the Contemporary Arts has invited us back to use their studios towards alumni sharing an open rehearsal! We'll be working in one of the dance studios on the 4th floor of SFU Woodward's most of the day, with the open portion being 2pm - 4pm. Come join if you'd like! Through a generous space residency from the Gateway Theatre, Hong Kong Exile will be developing the full-length version/sequel of NINEEIGHT and will be doing a workshop preview at the Gateway Pacific Theatre Festival this Fall. Hong Kong Exile will be bringing NINEEIGHT to the Scotiabank Dance Centre for a showcase at the Western Arts Alliance Conference. It's a large event where arts presenters from across North America congregate; this year it's being held in Vancouver. More details can be found on the Western Arts Alliance website. At Dancing on the Edge 2015, NINEEIGHT will be presented in Vancouver for the first time since the original workshop version. Many thanks to the Firehall Arts Centre; details and tickets can be found here. Under the guidance of Jamie Long and Maiko Bae Yamamoto from Theatre Replacement, several of the emerging companies out of SFU will be tackling the theme of curiosity. + O, o, o, o. Tickets are $15; available through the Shadbolt Box Office (604-205-3000; tickets.shadboltcentre.com). Shoutout to the alma mater of most of the companies: SFU School for the Contemporary Arts. Hong Kong Exile has been invited to present NINEEIGHT at the Seattle International Dance Festival! The second weekend in the festival’s Inter/National series, set at Raisbeck Performance Hall, features artists from near and far with local Seattle favourite badmarmar Dance (Marlo Martin), and Hong Kong Exile, treating the embroiled politics of that region in Asia. badmarmarDANCE, a bold, succinct, and emotionally driven local modern dance company performs this feels like a rut or a groove…depends on how you look at it. Hong Kong Exile (Vancouver, Canada) presents NINEEIGHT a sensory-driven, multimedia dance theater work inspired by Mo Lei Tau, a phenomenon of absurdist, comedic film, that emerged in Hong Kong in the 1990’s. Tickets and information can be found at this link. eatingthegame will be presented at Intrepid Theatre's 2015 Uno Fest in Victoria, BC. Friday, May 15th -- one night only! Visit these links for more information about the shows or about tickets.